After waging a bloody war against the Kurds both at home and in Syria, it is the ultimate irony that Recep Tayyib Erdogan’s fate in the presidential and parliamentary elections on June 24 will be determined by Turkey’s Kurdish political movement. The Kurds comprise about 15 to 20 percent of Turkey’s population, and 10 to 13 percent of voters. Depending on whether the elections will be free and fair, it is they who will decide if the incumbent Justice and Development Party (AKP) can retain its majority in parliament. More importantly, the pro-Kurdish Peoples’ Democratic Party (HDP) could become the kingmaker in the presidential election scheduled the same day. This is a lot of responsibility for a brutally suppressed political movement whose leader is behind bars. A vast number of other influential HDP parliamentarians are either imprisoned or have been dismissed from parliament on flimsy charges. Nearly 100 elected Kurdish mayors are behind bars as well, their positions occupied by trustees, appointed by Ankara, who are busy eradicating all manifestations of Kurdish identity. Most polls show Erdogan unable to reach the 51 percent required to secure the presidency, in the first round of the election. This mean the president will be determined in a second round between the top two candidates. One thing is certain: whoever goes to the second round against Erdogan will tip the balance to his (or her) favor only with massive Kurdish support. This is why the two most likely contenders against Erdogan are already courting Kurdish voters. Turkey’s repressed Kurds are now the best hope to unseat Erdogan, who has been running the country for 16 years. Turkey’s Kurdish movement proved it is a force to reckoned with in the June 2015 parliamentary elections, when the HDP and its charismatic leader, Selahattin Demirtas, received 13.1 percent of the nationwide vote. This was a watershed moment: the AKP lost its parliamentary majority and a Kurdish party cleared the 10 percent parliamentary threshold for the first time. 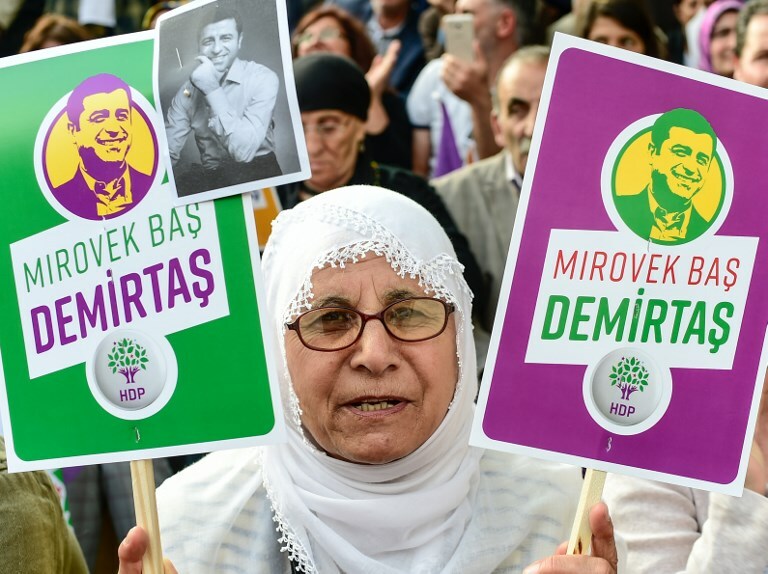 The fact that the HDP won 80 seats and became the third-largest party in parliament, ahead of the far-right and vehemently anti-Kurdish Nationalist Action Party (MHP), came as a shock to the establishment. Not surprisingly, this Kurdish victory terrified the MHP leader, Devlet Bahçeli, who had declared on the eve of the election that he would not support any attempt by opposition parties to form a government. The MHP’s antipathy toward the Kurds thus blocked any hope of an anti-AKP coalition. Bahceli’s move also lay the foundation for a nationalist alliance between the MHP and the AKP. This nationalist coalition ended up returning the AKP to power with a strong parliamentary majority in new elections a few months later. More critically, the AKP-MHP de facto coalition paved the way for the presidential system Erdogan so desperately wanted to establish since he became president in 2014. Last year, Erdogan narrowly won a referendum that changed the Turkish political system from a parliamentary regime to an “imperial” presidency with no checks and balances. According to international observers, the vote in the Kurdish southeast was rigged in Erdogan’s favor. Bahceli’s support to Erdogan over the last three years has been conditional on only one demand: crushing Turkey’s emboldened Kurdish movement. Erdogan happily delivered. He had an axe to grind with the HDP for not supporting his presidential agenda, despite his overtures to the Kurds in granting them more cultural rights than any previous government. Erdogan had assumed that his peace process with the Kurds, which gained momentum between 2013 and 2015, would generate the critical political support he needed for changing Turkey’s political system. Yet, Demirtas, the HDP leader, wisely refused to support Erdogan, on the grounds that the Kurds should not support an autocratic agenda in return for an unreliable peace process with no genuine democratic reforms. Erdogan has not forgiven Demirtas for this “betrayal.” After losing the June 2015 parliamentary election, the MHP’s opening to the AKP and growing American support for Kurds in Syria offered the two excuses he needed to stop the peace process and unleash a vicious war against the Kurdish militant group, the PKK. This paid off for Erdogan in the November 2015 elections, called to end the deadlock in parliament. The AKP re-established a strong majority, but the HDP still managed to just pass the 10 percent threshold, chalking up 10.76 percent of votes. What will happen later this month? Polls show that Erdogan is paying a heavy price for the meltdown of the lira and his mismanagement of the economy. Inflation is high, and consumer confidence low. Moreover, the main opposition candidate from the center-left Republican Peoples’ Party (CHP) has fiery charisma. Together with the right-wing Good Party – formed by former MHP members who rebelled against Bahcelli – the opposition has a real shot at winning in parliament and at unseating the “Sultan.” But they need more than just unity against Erdogan’s nationalist alliance with the MHP: Kurdish support will make or break any realistic hope of saying goodbye to Turkey’s strongman. In short, both opposition candidates need Demirtas and the HDP on their side. In a message from prison, Demirtaş recently stated: “Beyond any doubt, the HDP will be the key. [In the second round] it is almost 100 percent assured that the winner will be the candidate who will be supported by the HDP. Everybody should calculate accordingly.” CHP’s presidential candidate Muharrem İnce has done just that. İnce started his campaign by visiting Demirtaş in prison and then travelled to Hakkari, a Kurdish nationalist stronghold at the eastern end of Turkey. If the Kurdish votes from the southeast are not rigged, the CHP candidate has a real chance at becoming the next president of Turkey. Turkish politics is a very vengeful contact sport and most Kurds will no doubt see divine justice in Erdogan’s defeat. Ömer Taşpınar is a senior fellow at the Brookings Institution and a professor of national-security strategy at the National Defense University in Washington.